Windows Vista and Windows 7 indexes all the files that are contained in your libraries, the start menu, your emails, Internet Explorer’s cached files and the offline files. The indexing service imposes high load on your PC and thus decreasing the performance. These locations are selected by default, but we can alter them and choose only those which we really require. 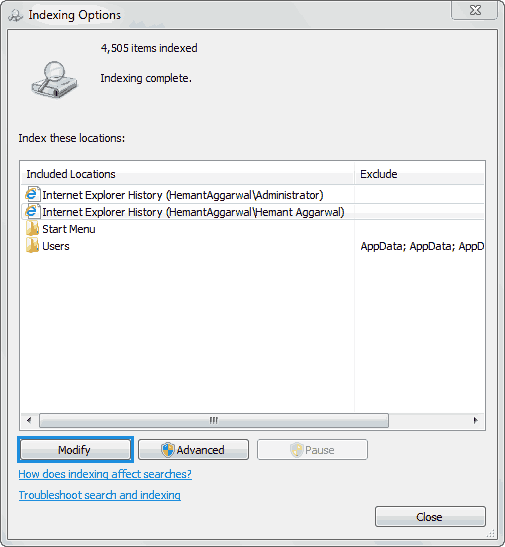 You can also turn the indexing feature off completely and use a better search application like Everything. 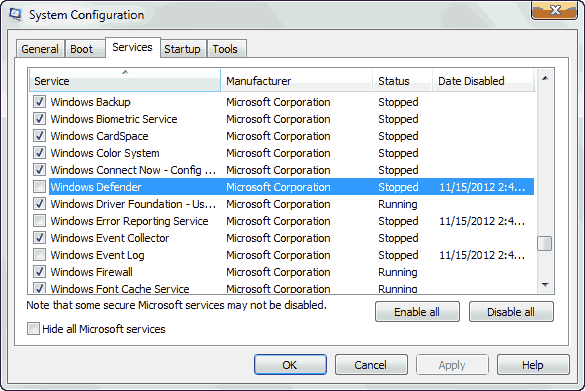 Windows Defender : It came in Windows Vista and is carried to Windows 7 too. This is an inbuilt virus and malware protection module from Microsoft. If you have installed some other application for virus protection then you must turn this feature off. There is no point keeping two anti-virus programs running at the same time. REMEMBER Disable Windows Defender only if your anti-virus program also has an anti-malware built-in. Most of the new and good anti-virus programs are anti-malware too. 1. Open “Control Panel” and click on “Indexing Options”. 2. Now the Indexing Options windows will pop-up. This will show all the locations which are being indexed for your search results. If all the locations that show up here are required then skip the next step. 3. Click on “Modify” and untick all the locations that you don’t want to get indexed. Leaving only the important locations where you search more often will increase the speed. You can also remove “Users” and “Start Menu” by clicking on them and deselecting them from the top pane. But we recommend you to include “Start Menu” in the index. This is because all the programs installed on your PC have shortcuts in the Start Menu and searching for those programs becomes a lot more easier with the Windows default search. 4. Now just close everything and you have successfully configured the Windows Indexing Service. 1. Open “msconfig”. Follow this tutorial to find out how to open it. 2. 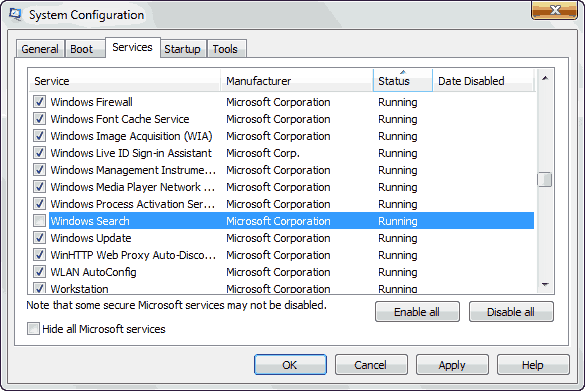 Go to the “Services” tab and untick “Windows Defender” to disable it and “Windows search” to disable the indexing service completely. 3. Click on “OK” and if it asks for restart then do it if you have saved all your work. You can also restart it at a later time (Your setting will be saved). P.S. Windows Defender in Windows Vista and Windows 7 is not bad, but there are many anti-virus programs that are much better. We recommend you to at least replace it with Microsoft’s own free antivirus : Microsoft Security Essential. Also the indexing service takes huge CPU resources, but is good for searching applications and programs. 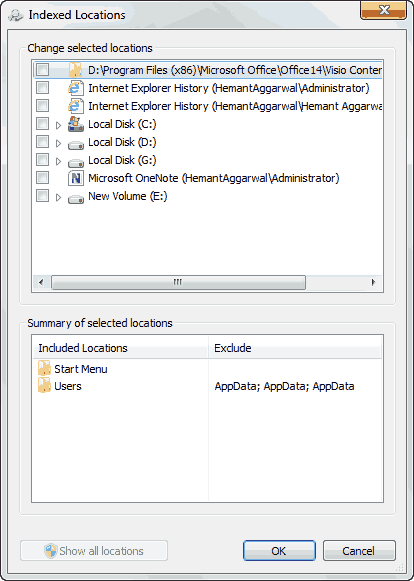 For us, we keep only the “Start Menu” in the Windows Search Index and deselect everything else. And we have installed Everything, a program that indexes your files within seconds and gives real time results (as soon as you type).